Bouldering is a form of rock climbing at low height. A minimal amount of equipment is required. Bouldering is a fun and safe introduction to rock climbing. 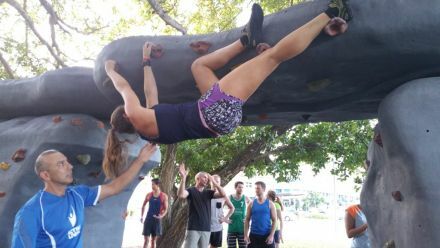 Bouldering is suited to all levels of fitness and climbing experience. Over the sessions you will learn and develop skills to solve a range of climbing problems. Like any form of rock climbing it is good for the body, mind and soul. If you have climbing shoes, bring them along - Dunlop Volleys are a good alternative and of course sneakers are fine. Bring a water bottle and a towel.